Fort Thomas resident Thomas Jackson sells antiques obtained in England at his new store, Bloodline Merchants, on Eastern Ave. in Cincinnati. 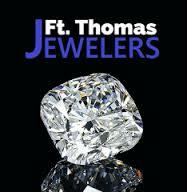 Thomas Jackson and his family recently moved from England to Fort Thomas, KY. With them? Enough antiques to fill a 4,600-square-foot shop across the river on Eastern Ave.
Bloodline Merchants, located at 4855 Eastern Ave. in Cincinnati, is filled with unique, reasonably priced antiques, many of which are found at the Newark International Antiques & Collectors Fair, which is held every two months, northwest of London. As a child, Jackson lived within a mile of the Fair, and he and his friends would walk across the farmers' fields to get to it. Vendors from all over Europe, including Eastern Europe, France, Germany and Spain, sell antiques, drawing in buyers from around the world. Currently in Belgium buying diamonds directly from the source. This is an advertisement. Jackson, who opened Bloodline Merchants in June, plans to make a trip to England every few months, hand selecting enough antiques to fill a shipping crate. During his last trip to England Jackson also visited the Lincolnshire Antiques & Home Show in the East Midlands. Visitors can stop by, sit in a leather Chesterfield and drink a complimentary cup of Carabello coffee. Provided. He also buys to order. Need a breakfront bookcase? Take a trip to Bloodline Merchants, where Jackson will offer you a cup of Carabello Coffee or tea. 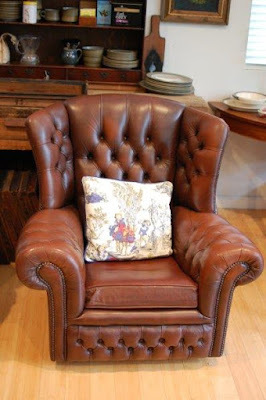 Sit in a leather Chesterfield armchair, describe what you want, and provide dimensions. Jackson will look for it during his next trip to England, bring something back and offer you first refusal. If you love it, he'll sell it to you for a steal. If you don't, no worries—he'll sell it at his store. Items are beautifully arranged in Jackson's multi-room store. For years Jackson worked in the stressful world of finance. He was good at it, but he's found happiness in this new line of work, and more time to be with his three sons: William (11), Roman (10) and Luke (7). He hopes he's found a niche in the U.S. antique market, a spot between the stores where you have to dig for treasures and the ones that cater to an elite crowd. "We sell genuine, good quality antiques at a reasonable price that the average person can afford," Jackson says. While leather Chesterfields are Jackson's speciality, treasures, large and small, abound. The collection is beautifully curated and arranged in the multi-room store. Items include original, vintage London bus signs, cut from the original roll and framed, some for as low as $95. There's an old Brownie projector, shipmaster's lamp, linens and a table made from an old fire door. There's a large industrial dairy cooler, perfect for filling with ice and beer at a party, and a large wine storage crate once used at a restaurant in France—perfect for a home wine collection. Jackson also specializes in leather Chesterfields, at incredibly reasonable prices. A wine crate from France. While most of Bloodline Merchants' goods are antiques, he also sells some repurposed items, including a bench covered in old Eastern European leather, which was used on children's gym equipment—if you look closely you can see a few Romanian children's names carved into the seat. The pieces he sells are full of stories, unstuffy, meant to be used. Jackson often has a large selection of linens. Jackson has also teamed up with local sellers and artists, including Keith Neltner, who designed his logo. He also sells some local and non-local artisan goods, including Maverick Chocolate, James Billiter prints, Peg and Awl bags and Maple Ridge soaps. Store hours are Wednesday, 11 a.m. to 5 p.m.; Thursday, 10 a.m. to 5 p.m.; Friday, 12 p.m. to 7 p.m.; Saturday, 10 a.m. to 5 p.m. and Sunday, 11 a.m. to 3 p.m. Other times by appointment. Visit Bloodline Merchants online here, on Facebook here, and on Instagram here.